Despite the recognized importance of Family Planning in reproductive health, efforts to maximise its’ gains, experiences numerous setbacks, especially, in developing nations, where commitments and attention focused on HIV/AIDS pandemic may have significantly overshadowed it, to an extent that, it only occupies a peripheral compartment within discourses on reproductive health interventions. As a result, this study sets out to make a case for Family Planning by questioning the dynamics which influences contraceptive acceptance and use among Somali refugees with a view of providing empirical evidence, where current practices regarding family planning, health education and promotions may be reshaped and improved, and at the same time, make available a status data on sexual and reproductive health behaviors, which have been found to be visibly missing out on health surveillances among refugee community. 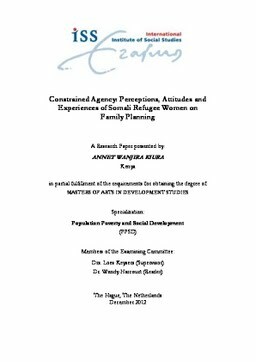 In order to achieve this, two main research questions, on how the prevailing perceptions, attitudes and experiences of Somali refugee women influence and shape contraceptive use, and on how, women interacted with service providers and surrounding environment in ways which influences their contraceptive choices. These were interrogated through a qualitative case study with, 33 research participants in Kakuma refugee camp in Kenya. The resultant data were analyzed qualitatively, using five steps of thematic data analysis, which are transcription, open coding, axial coding, selective coding and writing of research report. Findings from the study demonstrated that, majority of Somali refugees rarely used contraceptives, while quite a number of women would wish to use contraceptives to plan their families, reasons such as cultural and religious practices, misinformation, illiteracy, and counterproductive approaches towards reproductive health in general, militated against such contraceptive acceptance. Hence, Somali refugee women emerged as having constrained agency when it came to decisions regarding family planning, as a result of such intersecting complexities.